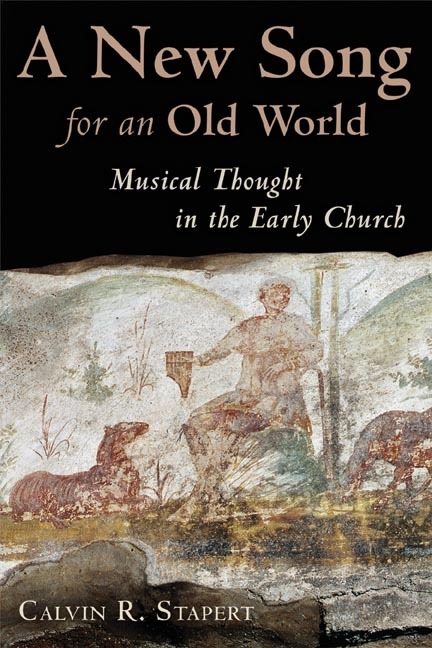 A New Song for an Old World: Musical Thought in the Early Church, by Calvin R. Stapert. Grand Rapids: Eerdmans, 2007. 232 pp. $18.00. In his book A New Song for an Old World: Musical Thought in the Early Church, Calvin R. Stapert, who taught for many years at Calving College in Grand Rapids, sets out to bring to the fore early Christian understanding regarding music (4). Stapert’s contention is that since the time of the enlightenment, the church has deviated from the traditional views of the early church fathers and other pre-enlightenment Christian figures (5–6). He calls Christians of the post-modern era to hearken once again to the voices of those who have gone before, particularly to those of the patristic period, in order to “enrich, broaden, and correct our thinking” (4). Stapert’s book consists primarily of examples and excerpts from the writings of early church fathers along with his own commentary highlighting or expounding upon their ideas. After setting the stage for the remainder of the book in the first chapter by stating his purpose and outlining how he plans to develop that purpose, he turns the reader’s attention in chapter two to what the New Testament reveals regarding the church’s song in the first century (1–28). In subsequent chapters, Stapert examines the thoughts of the periods that followed the New Testament era all the way through the fourth century, ending with the writings of St. Augustine (29–193). In his final chapter titled “Postlude: What Can the Early Church Teach Us about Music?” Stapert draws inferences regarding what the early church fathers have to say to modern Christians in the area of music and worship, thus providing the reader with some concluding thoughts to ponder (194–209). As an added resource, the author includes in the appendix examples of some of the hymns of the early church (210–16). At the beginning of his book and at various points throughout, Stapert refers to the “new song,” which “referred to Christ, the Word of God, or to the Christian life” (2). The “new song” is that which is sung by the church as “a joyful response to the works of God, stimulated by the Word and the Spirit. It is sung by humans to God and to each other, with the saints and angels and all creation” (28). He contrasts the “new song” with the song of the world throughout the book by showing how the church fathers differentiated between the song of the church and the song of pagan society. Although differences of opinion existed among early church leaders regarding the degree of separation from the world Christians should have, Stapert quotes early writings, showing indications of the development of an overall “patristic polemic against pagan music” (41). This polemic, claims Stapert, came to a “peak in the fourth century” with St. Augustine (41, 181). Clement of Alexandria is the first of the church fathers which the author turns to for insight regarding music (42). Stapert points out that Clement affirmed music that is “sober, pure, decorous, modest, temperate, grave and soothing over against music he describes as licentious, voluptuous, frenzied, frantic, inebriating, titillating, scurrilous, turbulent, immodest, and meretricious” (54). Clement used the latter style of music to describe the pagan music of his day. The author explains how Clement, the other church fathers, and many of the ancients all believed music was “involved in shaping a person” (55). In Clement’s thinking, music could not be separated from its occasion; Stapert contends that “Christians make music because they are thankful” (57). He continues, “But if music fulfilled its primary function of being a part of a thankful, sober revelry, it would also contribute toward shaping sober and joyous character” (58). Following this, Stapert draws attention to Clement’s contemporary Tertullian. The author highlights Tertullian’s vehemence of the “public spectacles” and consequently the pagan music connected with them (70). Commenting on Tertullian’s stance on pagan rituals and music, Stapert notes, “The music that accompanied them belonged to them and could not be torn from them and placed in a different context” (71). Stapert shows how Clement and Tertullian, though very different in many ways, shared remarkably similar opinions in their abhorrence of pagan music and their love of psalmody and hymnody (74–75). Moving into the time frame of St. Ambrose of Milan and St. John Chrysostom, Stapert sets out to show the commonality between the views regarding music of these two church fathers and those who preceded them (92–130). St. Ambrose, the author points out, was probably the only church father who “was not squeamish about bringing popular dance music off the street and using it to enliven the stodgy chant that dominated church services” (92). However, Stapert notes that Ambrose, in harmony with the other church fathers, “railed against the pagan music of his day and lavished unstinting praise on the psalmody of the church” (101). The author concludes from Ambrose’s writings that “the ‘new song’ sung by the redeemed creation could not be part of the sensual, frenzied music of an old world” (108). In his handling of Chrysostom’s writings, he points to the church father’s disdain for the music which was a part of the pagan ceremonies and theatres of his day. Chrysostom was addressing the problem of Christians participating in these pagan activities, activities that were incongruous with their identity as followers of Christ (122–23). The music condemned by the early church fathers, says Stapert, was, “the music of the popular public spectacles, the music associated with voluptuous banqueting, the music associated with pagan weddings, and the music of pagan religious rites and festivities” (145). He also points out that “the early Christian writers aimed no polemic at the nobler art music or the folk music of their day” (145). The music they collectively affirmed was that of hymnody and psalmody (149). In the chapter devoted to St. Augustine, Stapert shows how Augustine, along with the earlier church fathers, affirmed psalmody and hymnody but also cautioned against delighting in these forms of music more than God himself (180-93). Summarizing Augustine’s words, Stapert writes, “Delight in eloquence and music should never be an end in itself” (193). Rather the music of psalmody and hymnody should serve to increase one’s love toward God (193). In the final chapter, Stapert offers some suggestions about the bearing which the writings of the early church fathers regarding music have upon the church today. He urges his readers to make use of the “whole Psalter” and “the best of their hymns” (194). He also recommends “making psalms and hymns a part of our daily life” (194). Stapert says Christians should be ready and willing to condemn the music of their society just as the early church fathers condemned the music of their Roman society (196). “The early Christians can inspire and encourage us by their courageous and unwavering posture against the corrupt and very popular culture of their day,” writes Stapert (200). However, the author points out, the early Christians cannot show present-day Christians where the line should now be drawn between the church and popular culture. This is left for the reader to decide by the guidance of the Holy Spirit (200). Finally, Stapert cautions the reader to be careful not to sing the tune of the “old song” of this world but rather to sing the “new song” of heaven (208–9). By gathering together the writings regarding music of the early church fathers, Calvin R. Stapert effectively demonstrates the need for present-day Christians to examine whether or not they are compromising by participating and adopting the unbiblical practices of pagan or secular society. Against the argument that churches must “adopt the music of the ambient culture” in order to reach the world, Stapert points out that the early church fathers “never sacrificed their essential countercultural stance in order to entice people into the faith” (199). This point is well made and in need of hearing by those in the church who are attempting to attract converts to Christianity by using the things of the world to “entice” them. Elsewhere Stapert says, “I believe that there would be a marked difference in the church’s music if Christians truly recognized to whom and with whom they are singing” (202). Much of what is called “worship” today lacks the essential reverence and awe for God clearly portrayed through the writings of the early church fathers. He urges the reader to remember the One who is the primary audience of church music (202). Stapert rightly points out the truth that similarities exist between the Roman culture in the time of the church fathers and the culture of the present. What he does not adequately recognize and address in the book are the differences that exist between the pagan cultural practices of the first few centuries and the popular cultural practices of today. For example, in chapter nine titled “Rejection: The Music of a Pagan World,” the author gives specific examples of pagan religious rituals and other events in which music was utilized (131–48). One example given of music’s improper use was for the purposes of child sacrifice (133). Another example involved the worship of pagan gods (136). These uses of music were clearly wicked—there can be no mistaking—and the early church fathers were right in condemning music associated with these practices. It would have been helpful if Stapert had provided clearer examples of music used in today’s popular culture that would have been condemned by the early church fathers, if that is possible. Though similar in some ways, issues surrounding music in present-day culture are arguably more complex and intricate than the issues that surrounded music in the time of the early church. A New Song for an Old World: Musical Thought in the Early Church is an interesting volume and offers understandable, valuable insight into what the early church fathers thought about music. Every Christian stands to benefit as a result of reading this book, and most especially those who are involved church music ministry. Stapert poses important points to consider as the church presses onward in today’s ever-changing world. 1 Pings/Trackbacks for "A New Song for an Old World: Musical Thought in the Early Church, by Calvin R. Stapert"